I have written before about how Colin believes that I am a superhero. His stubborn insistence that I am the very best version of myself allows me to do crazy things like raise humans. For years he has been encouraging me to enter writing contests, emailing me links to submit articles, or forwarding me profiles of writers on a trajectory he thinks I should follow. I always open the link, email or article, smile to myself about how sweet it is that he thinks I am capable of such things and delete them. This past week, he sent me a link to submit something and I was just about to read, smile, and delete, when I decided that maybe I would just let it sit in my inbox for a change. Now it sits in my inbox like the email equivalent of a giant pile of laundry, demanding that I eventually deal with it, but is easily ignored in the short term. I have been trying to figure out why read, smile and delete has become the fallback position for these emails, and I think it’s because on some level I think that entering these contests is an exercise in futility. I won’t win. It dawned on me yesterday as I trudged along for a morning run where my efforts to appreciate the triumph of spring were interrupted by the peanut gallery of aches and pains in my hips. I realized that I have entered many marathons and half marathons with no intention of winning. Never once when I have shown up to the starting line of a race has winning crossed my mind. 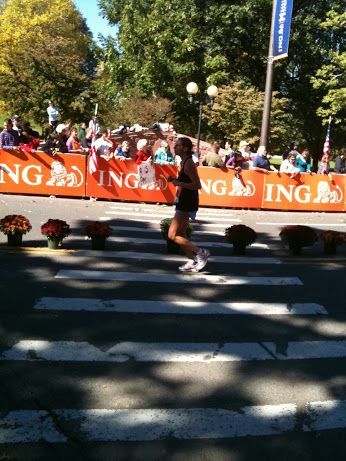 The Hartford Marathon is a favorite. It is close to home and is a big enough race to have good snacks and a great shirt, but not so big that you have to walk an extra mile at the end to find your family. It also has a switchback so that when I am at mile 17 I see the people who will win at mile 23. Mile 17 is a horrendous part of the race for me. I have run far enough that I know I will finish but I still have nine miles to go, and everything hurts. It is the part of the run when I promise myself that I will never, ever, ever be seduced by the notion of a foot race ever again. Meanwhile, coming the other direction are runners who are only a few miles from the finish line; as my feet pound the road, theirs seem to glide, as my hips curse at me with each step, theirs seem to be well oiled joints in a high performance machine. It’s all in my head of course. They too are working incredibly hard. They will finish this race much more quickly than I will, but we both will finish. I would never enter a race to win, I enter it to finish. I enter them so that I can remind myself that if I can get past the internal voices at mile seventeen I can run another nine, not to win but to finish. Today, I will re-open that email from Colin, and I will write something to submit to this contest. I will ignore the voice in my head that tells me it will be received by a room of people who will laugh at it. They will think it’s so awful that they will quote it to friends as the worst thing they ever read. Or when I am feeling optimistic about it I think it will end up in the “close but only because she has good hair pile.” Either way, I am going to enter because I am old enough to know that I don’t enter a race to win. We create our own obstacles, if I decide that success is a condition of embarking on every venture I might as well never leave the house. Everything has it’s mile seventeen moment where you can look over and see someone who probably is having more fun than you are. The thing is, that we all end up at the same place. My obstacles, and fears are actually just as loud sitting comfortably in my living room as they are at mile seventeen, so I might as well at least enter the race.